1. Preheat oven to 425°F. 2. In large mixing bowl, combine vegetables and oil; toss until vegetables are evenly coated. Sprinkle with salt and pepper and toss again. 3. Spread vegetables out evenly on large baking sheet with sides. Roast for 20 to 25 minutes, stirring occasionally, or until browned and tender. 4. 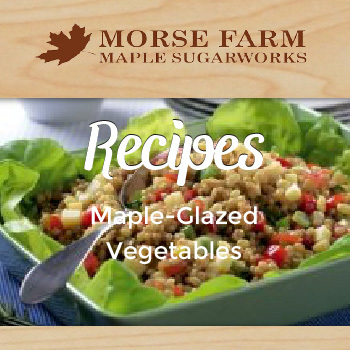 Drizzle with maple syrup and toss to coat. News from Vermont #405 Vermonters Ain’t Nuthin’ If They Ain’t Quirky! News from Vermont #404 From One Generation To The Next ….It’s All So Sweet! News from Vermont #401 Burr Of All Trades….